The Hug-a-BubÂ Wrap Carrier Lightweight Organic boasts all the convenience of the wrap, is ideal for warmer weather or as a second carrier and comes at a price to delight the budget conscious. Front and Backpack carrier with lumbar support. The NEW Omni 360 Carrier is a forward facing, newborn ready baby carrier that delivers better than ever comfort and ergonomics without the need for an infant insert. 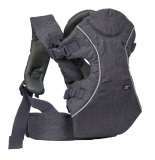 The Joie Gemm infant carrier is a safe designed and engineered carrier to keep your little one cosy.